admin June 22, 2018 June 22, 2018 No Comments on Understanding The Functions Of Device Drivers! A hardware driver is a small bit of code i.e. packaged in a file that lets a computer system to use a piece of hardware. Every computer needs a hardware driver in order to function. Updating a hardware driver like a Bluetooth, mouse, keyboard, scanner, digital camera or a printer driver can add a new functionality to the component. For instance, notebook drivers include added features as well as improved configurations menus with an updated driver. Importance of drivers: Device drivers are the small codes or files that form a link of communication to your computer’s operating system and the hardware. Every piece of hardware that you install in your system requires a device driver in order to make your system function properly. The windows operating system usually comes incorporated with a number of device drivers that can recognize the common components of a desktop hardware and provide an instant functionality to the user. Different types of device drivers: There are a variety of device drivers out of which some are specific to different machines. For instance- the drivers for laptop are proprietary and are installed by the manufacture and a desktop is typically the exact opposite. In case the hard drive of your laptop is reformatted or because of some or the other reason gets deleted, all the original drivers will remain unharmed. But in the case of a desktop computer, you will have to visit a website of the manufacturer; download and re- install the drivers along with the other operating system. What if a functional driver turns dysfunctional? : There may be times when a device driver doesn’t function as planned. In such a case, you will find that the manufacturers will make improvements to drivers just the way a software developer upgrade a program. Besides this, there are cases when such upgrades can make the older drivers outdated. Similarly, a driver that is updated can heal a wide range of errors and behavior problems i.e. tolerated by a particular device. For instance- if your printer is not functioning properly, you can simply fix the issue with the help of a driver. This is as simple as downloading the corresponding driver by checking a manufacturer’s website. The working of a device driver update: A device driver downloads to your system just like any mother program. Moist of them gets download in the form of an exe or executable files. In most of the cases all you need to do is, click on the file and your installation process will begin. While the program gets downloaded, it initially scans your system in order to ensure the safety. It doesn’t take much for a driver to get installed in your system, but it normally requires a system restart so that a driver can properly function with the related hardware. 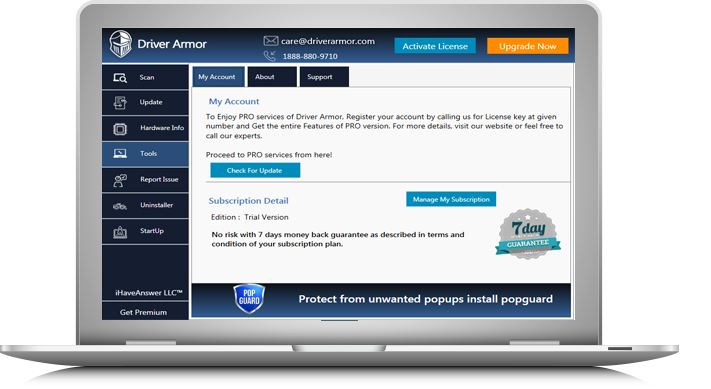 For any help regarding PC drivers, Driver Armor will be the best option for you. Stay Connected!